Ten pupils from Year 3 and 4 braved the wind on Wednesday taking part in the Agilitas Sports Tri Golf competition at Spalding Academy. All of the children showed great skills and the team spirit was lovely to see. They just missed out on medals with fourth place but they should all be very proud of themselves competing against 11 teams! The children had an amazing afternoon being inspired by double Commonwealth gold medalist Leon Baptiste. 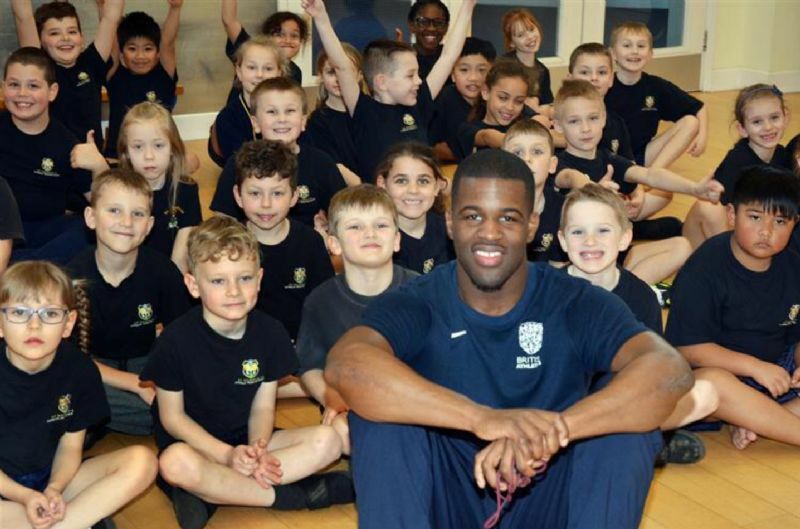 They all took part in a circuit training session with Leon and enjoyed an assembly learning about his career - overcoming a football injury to being a successful athlete. Leon encouraged the children to keep trying and follow their dreams. Thank you very much to the families and friends who sponsored the children they will benefit from the new PE equipment this money will allow us to buy. 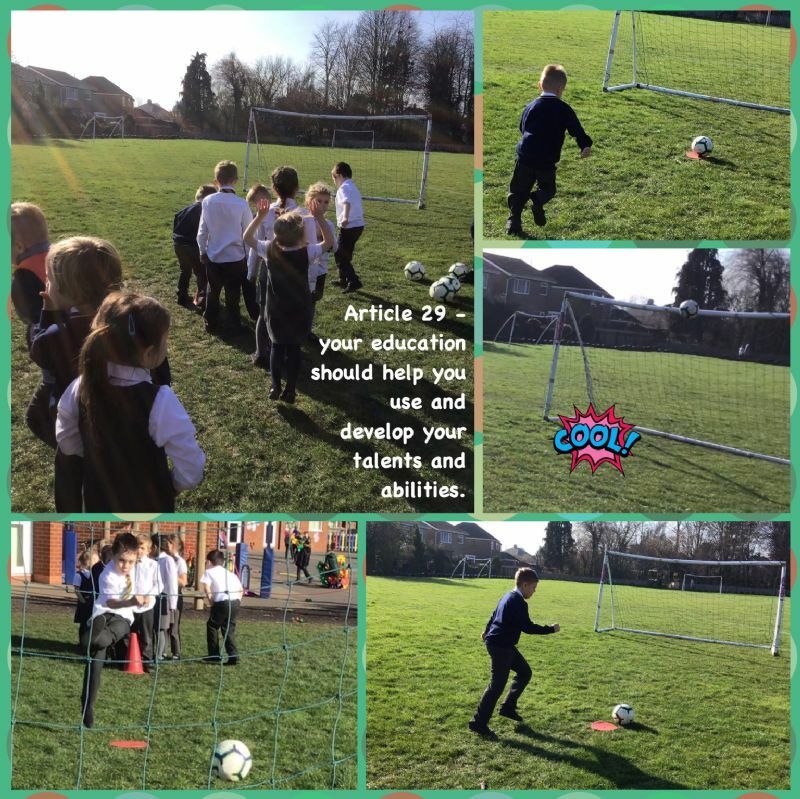 Our rescheduled KS1 penalty shoot out and KS2 Crossbar challenge for National Schools Football week took place today and lots of children in all year groups were having a go. Lots of penalties were scored and the crossbar was hit 13 times! Well done to all of those children who took part! Ten of our Year 5 and 6's took part in Bikeability this week - it started well on Wednesday with some lovely sunshine whilst they were cycling around the playground and learning the ABC of cycling, resulting in them all passing Level 1 by lunchtime. They then ventured out onto the local roads and were starting and stopping safely with plenty of looking and indicating. On Thursday the weather was against them but they put on brave faces and ventured out in the wind and rain to practice left turns from a minor to a major road and vice versa. the rain and wind had calmed down for the afternoon session with them all showing great confidence and skill with right turns into and out of a minor road. The improvement of their confidence on a bike was amazing and they all listened and worked really hard to acheive their Level 2. Well done! The Year 5 and 6 Netball team competed against Wygate Park Academy to start off the Elite Sports Netball Tournament. In this match there were 4 rounds in which St Norberts won 8 goals in total, which meant we won the first 3 rounds. During the last round Wygate Park Academy made a come back by scoring 2 goals, which led them to winning the final round. Although they didn't win, we were able to support them with our skill of sportsmanship. We had a spectacular time and are looing forward to the next match. The final score was 8-2. Report by Milena, Mija and Emilija Year 6. In a thrilling final for the Elite Sports Boys Football League, as title contenders St Norbert’s played Surfleet Primary School last Friday. In the first half, St Norbert's got off to a 3-0 start heading comfortably into the second half. St Norbert’s carried on their winning ways scoring another at the start of the second half and then shockingly conceded a penalty. However, the team pulled together and came back with 3 more goals eventually winning 7-1 which meant they won the league and came home with the trophy! Thank you to the parents for transporting the children to the matches and for supporting the team! We are looking forward to the Girl’s Football League next term! Three players were absent for the photo. This week we thought we’d share the children using the everyday play equipment they have available to them at play times using different skills, working as a team to create structures. They take full advantage of the trim trail and climbing wall to keep themselves warm now the weather has become more autumnal. In the advanced league, St Norbert’s played against John Harrox A, Tower Road Academy and Ayscoughfee in three thrilling matches. First, St Norbert’s played Tower Road. St Norbert’s got off to a great start, scoring 6 before half-time. The match finished 9-1 with Tower Road scoring a well-deserved goal. St Norbert’s then played John Harrox A in a very tight first half finishing 1-2. St Norbert’s finished the game 6-2. Norbert’s then played Ayscoughfee in their final match, finishing 3-0 at half-time and 8-0 at full-time! This Tuesday saw, six year 5 children and six year 6 children represented the school at the School Games Athletics competition at the Spalding High School. 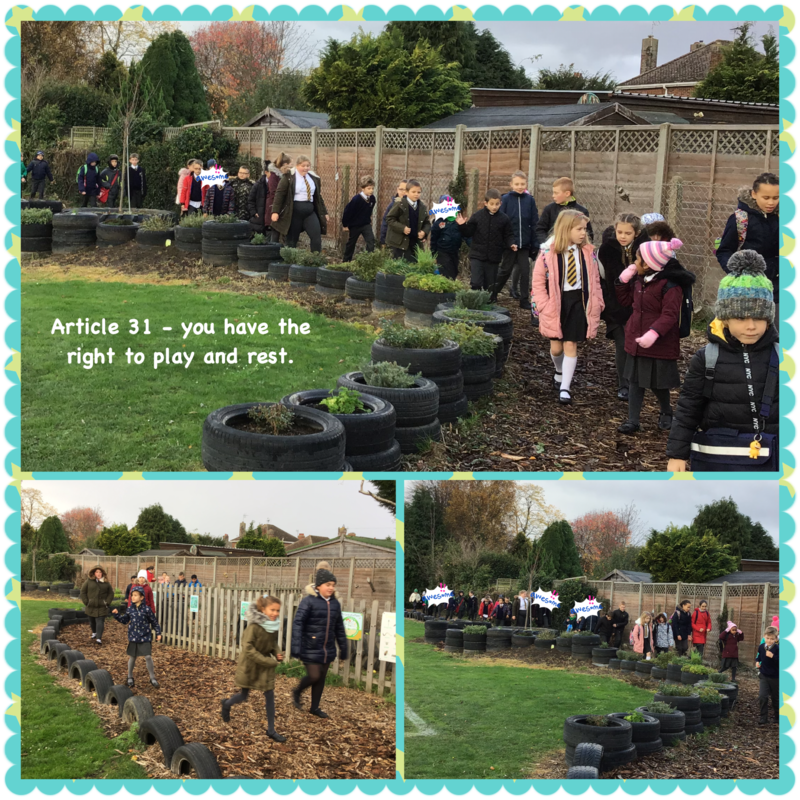 The day was made up with many events including running, jumping and throwing events and all the children had to participant in 3 events. The morning saw the running heats and the jumping events start. The boys were up first to run with 2 boys in each race of 400m, 150m and 80m. At the same time the girls were in action in the jumping events of long jump and triple jump. After this first round of events the boys and girls swapped round and it was the turn of the girls to take to the track and the boys to jump. After some more fantastic running and jumping by all, we sat to re-energise with some food and drink before heading into the last of the events before the finals. After the throwing was all complete the focus was purely on the running events and fantastic running from St Norbert’s that had made it from the heats. Each child did their best in each race and we couldn’t have asked for anymore. The event ended and the results were… Erin gold in 400m and javelin. Isobella gold in 150m and long jump. Nikola sliver in quoit throw. Amelia sliver in long jump. Vincent bronze in javelin. On Thursday pupils in KS1 and 2 took part in our annual sports day. KS2 Sports Day took place in the morning, whilst KS1 and EYFS took place in the afternoon. The day was a huge success and the lovely relaxed and ‘Family’ atmosphere was commented on. It was amazing to see so many children engaged in competitive sports, taking an active role in many short and long distance races. We were blessed with wonderful weather and our children all took the health and safety discussions about drinking plenty of water on board – well done. 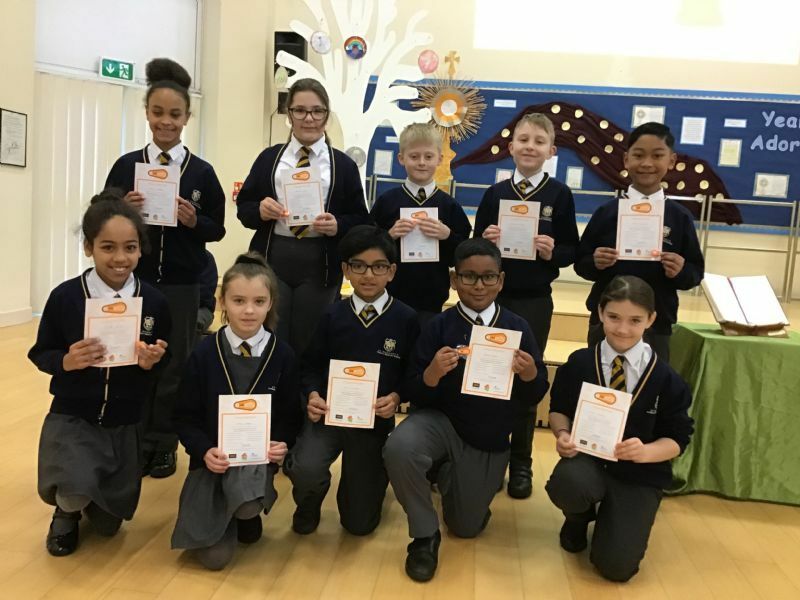 Well done to all the children who achieved a personal record or accomplished through resilience and determination – St. Norbert’s is proud of you! It was lovely to see so many smiles on the children’s faces and excellent competitive athletic! During the afternoon KS1 pupils were competing in a range of field activities including shot put throw, egg and spoon and football dribble, all of which were able to improve their skills in aiming for a target, control and balancing. The children worked extremely hard to score points for their individual houses and demonstrated some excellent sportsmanship qualities by supporting and encouraging one another. The children were supported by Year 5, who were extremely helpful towards the younger children through their demonstrations and offers of guidance. The afternoon was brought to a close with the pupils enjoying flat races in their year groups. The day was filled with great successes and the level of team work and sportsmanship by all involved was second to none. Thank you to all the parents and family members, who were able to enjoy the day with us and for those who supported the Friends by purchasing drinks and ice creams, £184 was raised for continued provision for the school. All the children of St Norbert’s took part in a multi-event school games day on Thursday the 23rd. The morning was kicked off with the opening ceremony which included an amazing dance that was created by Liga of Yr6 and the lucky children that represented their house and walked in with their flag. After this opening, the School Games started for KS2 with rounder’s, hockey, dodgeball and orienteering. Each year got to play in their house teams against other houses to see how many points they could gain and add to their house scores. It was a fun morning of sport with all enjoying the sports on offer! The afternoon was the turn of the KS1’S to try out lots of new and exciting sports, with Rounder’s, New Age Kurling and Orienteering on offer to them. Just like the morning there were lots of great sport happening and lots of children enjoying sports that they haven’t done much of before. After each class had completed the 3 events, that was it a day full of sport had come to an end and what a great day it was! All the children were showing the School Games Values throughout the day which was great to see! This term saw year 5 take on year 3 in a School Games quick stick hockey game at St Norbert’s. The game was organised by William in year 3, he sorted out his year 3 team and was captain for the team. He also organised for George in year 5 to ref with being a hockey player and knowing the rules. The game happened at lunch and was done over two 15 minutes’ half’s. The game was a good one with both sides having lots of chances but in the end the game ended in a draw at 0-0. An excellent game of hockey in a well-run game by William. Last Thursday saw the St Nobert’s year 5 and 6 football team take on Spalding Parish in charity football game. The first half was one of a mixed performance at times the team did wonderful, linking passes together and getting towards their goal and going so close on a number of occasions. At the same time moments of desperate defending by the whole team but it couldn’t stop the ball going in the net and ending the first half 4-0 down. The second half started and from the start everyone had up their game. The passing and movement of the team was brilliant to watch and from this came our only goal of the game, with Tom finishing calmly into the back of the net to make to 4-1. That’s the way it stayed then until the final whistle! A good performance by all against a very strong Pariah team! Monday saw St Norbert’s take part in the School Games Kwik Cricket day at the Spalding Grammar school. Ten young cricketers from year 6 and 5 took part representing the school and were all hoping to bring back some silverware. We had been drawn into group 1 putting us put against 3 other very strong teams from schools around the area, with our first game being against Ayscoughfee Primary school. A must win game to stay in the competition! St Norbert’s bowled first and kept Ayscoughfee down to 245 in their 8 overs, a score which we knew would be hard but was confident of getting too. The run chased was looking good with all the players scoring runs, but with a few wickets in the last couple of overs taking away lots of our hard earned runs. St Norbert’s sadly came up 20 short with 225 meaning Ayscoughfee went through to the 1st place match in the group and St Norbert’s would play to see who came 3rd in the group. The second game was a much better performance by all that were there keeping the opposition down to 244 and then with the bat putting on 260 in the 8 overs, putting us in 3rd place in the group. Overall a great days of cricket with all the St Norbert’s children showing off their amazing sporting ability. The Finals of the Primary Schools Hockey competition was contested last Friday at Glen Park, Surfleet. Having competed well in the previous tournaments the St Norbert’s team knew they would have to work hard to regain the title and the trophy. Games against St John’s (1-0 Win), Tower Road (3-1 Win) and Moulton John Harrox (3-0 Win) meant the final game against Ayscoughfee would decide the overall winner. In a very tight game just one goal separated the two teams with St Norbert’s coming out on top (1-0). Congratulations to all who played in the Finals and throughout the season. Goals scorers: George Morris (5) and Thomas Pilgrim (3). This Wednesday the school took part in a School Games New Age Kurling Competition at The Priory School in Spalding. Five KS2 children were chosen to take part in this newly made game to represent the school and hopefully bring back the trophy. Ten teams had entre the competition and so the competition was spilt into 2 groups of 5, with St Norbert’s being put in group A with some other very strong teams. The competition started well with a win for us, not bad for the first ever kurling that the team had done. The next game didn’t go as well with us having our first lost, but the team didn’t put their heads down and the next game bounced back with another win. The final game was a nail bitter with either team looking like they might win… it all came down to the last stone which the other team sent down knocking all our stones out the house and meaning the competition for us was finished. 2 wins and 2 losses was a good day of sport to say none of the players had ever played kurling before the day. So well done to all involved for doing so well. Over the past few weeks, St Norbert’s has been hosting its very own Winter Olympics. Six teams have been playing against each other at lunch in a School Games New Age Kurling competition. The six teams were paired against another team for the first round and after 2 very close matches and a drawn match, we had our 4 teams for the semi-finals! The semi-finals gave some great kurling action. Resulting in the first game coming down to the last end with a 4-0 score in the final end causing a massive upset to the competition. The second semi-final was another close encounter with both team’s neck and neck up to the final few ends but after a few nail biting throws, we had our 2 finalist. So the final would be team blue lead by George and team red lead by Erin. The final was all it was made out to be a game of high ability, both team had brought their A game to the match. After the first couple of ends George’s team had pulled out a little lead and from there were in full control. Erin’s team tried to pull it back but the gap had become too much and the final ended in victory to George’s team. This meant George’s team had the chance to beat a team made up of teachers to once and for all decided who is the best kurlers in the school. The teachers team barely scored a point as George’s team ran away with the score easy to take home the victory and be crowned best in the school. Well done to all that played in the tournament, from many not knowing what kurling was to now being experts is very great to see! This Tuesday saw 9 brave year 3 and 4 take on the cold weather at The Peele School, Long Sutton, for a School Games Football session. The morning was a mixture of the children being split into team with children from other school and a 1-hour training session to learn the basics of football, which all enjoyed. This was then followed by the first of each groups 2 games, all St Norbert children got fully involved in the games and even played against each other at times. A quick 30 minutes of lunch was had, then back to more games. 2 more games were played before the decision was made to come back as the weather was showing no signs of improving. Well done to all on a cold day to keep going and show their football ability! After last week’s win the team was full of confidence coming into this away fixture at St Johns. Like last week the team started well and was quick on and off the ball putting early pressure on St Johns. That continuous pressure gained its reward with a St Norbert’s goal 1-0. As the first half continued it was clear to see the teams were very evenly matched and this was going to be a long game. But as like magic the team stepped up a gear and put themselves ahead more making it 2-0, and just as quick 3-0. Half time came and we were back under way St Johns seemed the team to had stepped up a few gears’ now and was putting the pressure on the defensive players and goal. The likes of Erin, Amelia and Barundeep stopping any chances from going in, but they a goal was score, a rocket of a strike by St Johns made its way pass George, 3-1. As quick as we conceded a goal we scored one 4-1 and that how it stayed for the rest of the game. Great work again by all on to the next game! After a long wait since St Norbert’s last game the year 5/6 team were back in action against Swineshead Primary, with close contest on the cards. The game started with a great pace for St Norbert’s the team playing good football and going close within the first few minutes. The team continued to build pressure on Swineshead for most of the first half with the likes of Tom, Harley and Marcin all having efforts saved by the Swineshead keeper. But the pressure became too much for Swineshead as Tom scored for close range after the keeper made a mistake, 1-0 St Norbert’s. At the restart the team was putting on pressure once again, bring chances for a second, but this time it was Swinshead who manage to find the back of the net after a quick counter attack. Did this bring St Norbert’s down? No! Before you knew it Marcin had perfectly chipped the keeper and made the score 2-1. Half time. For a lot of the second half the team found themselves defending their lead, as Swineshead pushed to make it 2-2. Some unbelievable saves by George in goal kept the score to 2-1. As Swineshead looked to be able to level up, Tom thought it would be best to add another goal to make it a bit safer, with that he made a great run and scored. 3-1 St Norbert’s. Swineshead pushed all their players up field (even their keeper at times) to try and get a goal which they did. 3-2. Again they came with the pressure Swineshead but as the seconds ticked away Jamie found an empty net to bring the score to 4-2. Fantastic result. On to the next game and hopefully the win! On Tuesday, the children enjoyed an inspiring visit from Athlete and Commonwealth silver medallist, Laura Samuel. During the visit the children took part in a sponsored fitness circuit, where they were able to complete activities such as press ups, spotty dogs and star jumps. The circuits allowed them to experience what it might be like for athletes in training, it certainly got their heart rates up! In the afternoon Laura demonstrated the three steps of the triple jump, as well as explaining what sorts of exercises she needs to do to train. The children were even able to have a go themselves. Thank you to all the parents, grandparents and friends who were able to sponsor the children for the event. In total we raised £769.75 of which a percentage we have been able to keep as a school and will go towards PE equipment for the children to use during playtimes and lunchtimes. This last term saw a week long hockey tournament, using the School Games Hockey cards, being played between a year 6 and year 5 team. Each lunchtime, the two teams played in a friendly match and score points in a leader board. On the first match we played, the score was 8-5 to the year 5’s team which put them top of the leader board having played 1, won 1 and lost none! On Tuesday year 5 and 6 clashed again in a nail-biting match with a tied score of 11 all. This meant that year 5 were still ahead by 3 with 1 game remaining, could the year 6’s manage to catch the year 5’s? After 2 days of washouts since the previous match we had to play on the Friday. This was the deciding match for the year 5’s and 6’s because even if the 5’s and 6’s had a draw, the year 5’s would still win the tournament! In the final, the year 6’s ran rings around the year 5’s to run away 13-0 winners with both teams playing great hockey, meaning that the year 6’s won on goal difference! Well done to both teams for playing great hockey over the week. Also thanks to George and Harley for their part in setting up the tournament in the first place! Last Wednesday morning saw 6 teams for different school come to St Norbert’s for a School Games dodgeball competition. With a group of fine year 5 and 6’s competing for the school, it was set to be a good day of fun. At the last minute the word came that a team had pulled out and so St Norbert’s were asked to put in a second team. Our B team, was made up of six year 5’s and after a quick change they was ready to go. Both our teams had been put in the same group playing 2 group matches each. After the group matches had been complete St Norbert’s A were third in the group and St Norbert’s B were first in the group. Meaning that the A team would play for 5th place and the B team would play for 1st place. Amazingly both teams won, meaning that we finished 1st and 5th after a great morning of dodgeball. A brilliant job done by both team to finish where they did in a strong competition. After 3 weeks of brilliant football! The Make a Wish St Norbert’s Charity Football Competition using the School Games Mini Score has finally come to an end. Over the last 3 weeks we have seen some amazing goals been scored, some fantastic sportsman ship shown and each and every pupils getting behind their class team in support of this School Games Level 1 Soccer games competition. A few highlights that stood out had to be the goals from Tori Yr5 and Harley Yr6, Tori curling the ball into the net off a corner in the last minute against the year 3 team and in doing so stunning the crowd to silence. Harley also produced a stunner of a goal, with a bullet of a header going into the top corner and giving no chance to the diving keeper. They are a few of the goals of the competition but the player of the competition has to go to Eric in the year 4 team, scoring goals for fun at one end and stopping the other team from scoring in his team’s goal as well. After the 10 games all had been played and the points added up we have a winner of the competition, but a closer race than most expected with the top 3 being only being split but 2 points in the end. So in 1st place was… Year 6 A team with 11 points, congratulations to all in the team. 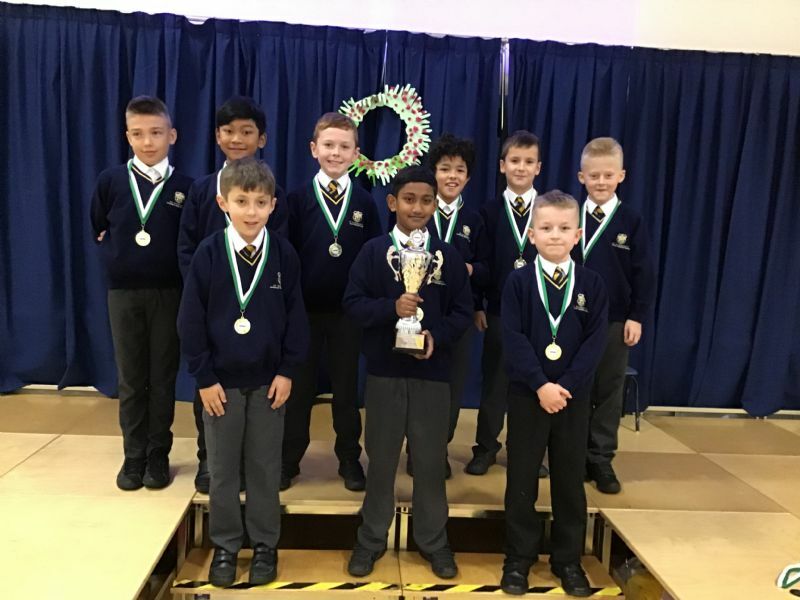 In 2nd place was Year 5 with 10 points, 3rd place was Year 4 with 9 points, 4th place was Year 3 with 6 points and finally in 5th place was Year 6 B with 4 points. Once again well done to all that have taken part and helped to raise some money for this wonderful charity!